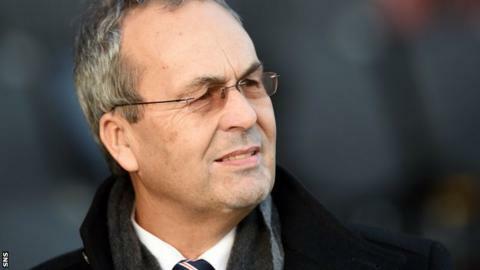 Ross County chairman Roy MacGregor has promised to increase investment in the club should they retain their Scottish Premiership status. Bottom club St Mirren can no longer catch the Dingwall men following a 3-0 win for County on Monday night. Liam Boyce's hat-trick also moved them six points ahead of second-bottom Motherwell and the play-off spot. MacGregor said: "The players have been on one-year contracts since we came in this league. We need to change that." Jim McIntyre took over as manager in September and has led the team to eight wins in their last nine matches. "I think we found our spirit again," MacGregor told BBC Scotland. "We lost a bit about what Ross County was as we came up the league. "This is our third season [in the top flight] and we've had to do it the hard way. If we can get by this season we need to just look at our strategy and how we develop. "We need to make more investment, particularly in Scottish-based players, and we need to take a longer-term view. "Third season in, [there is] no right for a club with our population to be here, but if you have good fans, good leadership, good vision, you've got a chance." The Highlanders still have five games remaining after the split, including matches against Motherwell and St Mirren. And MacGregor has sympathy for the Paisley side, who are 10 points adrift with five games remaining. "A lot of Ross County is about where St Mirren are," he said. "[I am] really shocked that a club with so much has a possibility of going down, so I have real great sympathy both for the board and for the fans. "I think St Mirren will come back stronger if they don't make it this season."